Huddle up with the most famous family in football--the Mannings Peyton and Eli Manning are now NFL superstars, but they are still kids in Family Huddle. Follow along as Eli and Peyton pile into the car with older brother Cooper for a trip to visit their grandparents. Their dad, former NFL star Archie Manning, is at the wheel, with mom Olivia at his side. The boys joke around and play football at every opportunity, running fun plays like the buttonhook, the quarterback sneak, and the hook and ladder. Family and football have always been a big deal in the Manning family. 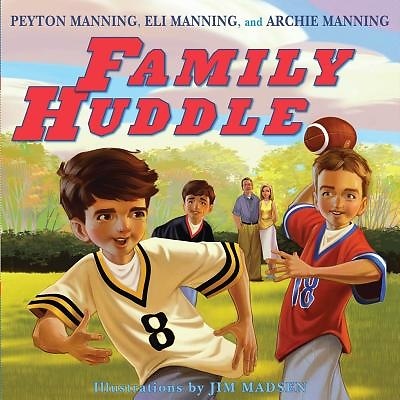 Family Huddle is based on some of the Mannings\u2019 memories from their days in Louisiana and Mississippi.